Yes, I can even mess up a wonky star! Ha ha. I watched a tutorial on Tuesday. Then Wednesday night I decided to try it. Of course I upsized it to make things go faster. But my mind changed the method without my permission. (Or is it that my memory is faulty?) 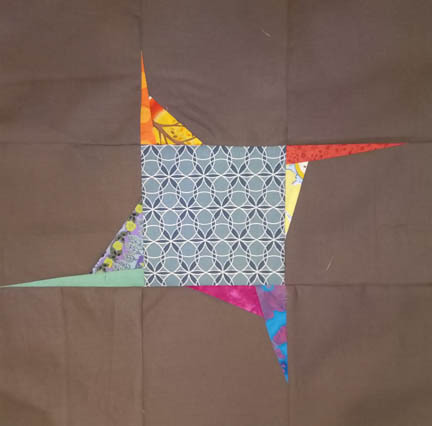 Regardless, my first two stars are different than what A Left-Handed Quilter showed. Her star was based on the tutorial by Jenny of Missouri Star Quilts. Oh well, I will make two more that hopefully will be somewhat like these two and then switch to smaller stars and the correct method -or not depending on my ability to follow directions on a given day. You may notice that they are not even like each other. The second one is closer to Jenny Doan's version. At this point my plan is to make the other two similar to these, then make smaller ones to alternate with solid background blocks. The four will be "super novas" in my galaxy quilt. Seriously, they are wonky stars so can you really mess them up if your final block is some type of star? 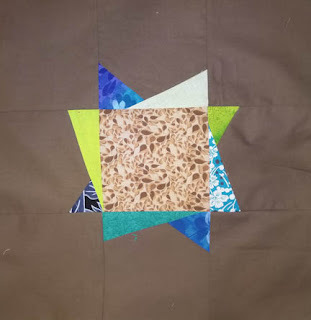 Wonkier is still wonky, the degree doesn't matter :) A variety of these blocks would make a fun quilt, especially in those fabrics. Just like people come in all shapes and sizes....so do your stars. Fun! I think you have the beginnings of a unique quilt. Thank you for sharing. I rarely follow directions, so happy alternatives are welcome. I like your stars! Maybe 'baby nova's' that want to grow into super nova's.